Tonight was an interesting night for the Wizards. They played half of the game without any scoring from their second best player in Bradley Beal and still managed to keep the Spurs down by over 25 points going into the fourth quarter. The final score will make this game seem a bit closer than it really was, but the Spurs never came close enough in the final minutes to pose a threat. 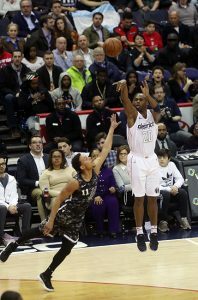 Markieff Morris led Washington with 15 points on 7-of-7 shooting in just 17 minutes, and the rest of the lineup showcased the kind of balance that helped the Wizards go 15-11 in 26 consecutive games without Wall. Prior to tonight’s game Wizards Head Coach Scott Brooks had ruled Wall out of tonight’s game, but with him returning to practice it now becomes will he return in the next week or will the Wizards continue to get him ready for the playoffs? Another big note for the Wizards was the production of their bench play. They put together 61 points from the reserves, led by 12 points by Ramon Sessions, who has proved to be a big help off the bench after they acquired him from the remainder of the season from his second 10 day contract. For the Spurs, they sort of just hung around and never really threatened the Wizards in the second half. Thanks to Washington’s 38-point second quarter and the injury of LaMarcus Aldridge, the game was seen as more of a blowout after he left the game.